Firefighters late Monday declared the structure of Notre Dame Cathedral saved after a massive fire gutted the roof and destroyed the spire of the Western cultural icon, shocking Parisians and the world. The huge blaze that started earlier in the evening destroyed the timber roof of the Gothic building and about two hours into the conflagration, the upper part of the 93-meter-high spire swayed and collapsed as flames shot up. Early Tuesday, newspapers including Le Figaro and Le Parisien quoted firefighters as saying the fire, which had raged for more than eight hours, had been brought under control and was partly extinguished. Some 400 firefighters battled the fire, aiming jets of water at the 850-year-old cathedral as solemn crowds watched quietly from behind police cordons. On one side-street within view of the flames, dozens of faithful kneeled and sang the Hail Mary repeatedly, punctuated by readings from the Gospels. President Emmanuel Macron praised the "extreme courage" of the firefighters and vowed: "We will rebuild Notre Dame." The cathedral was "our history, our literature, our imagination, the place where we lived our great moments - our epidemics, wars and liberations," Macron said. A national subscription would be announced on Tuesday to help defray the rebuilding costs, Macron added. He earlier canceled a planned address to the nation in which he was to announce policy measures in response to the Yellow Vest protest movement. "There is an immense sadness," Paris Mayor Anne Hidalgo said. Drone images had revealed a "terrible" situation inside the cathedral, Hidalgo said: "There is no roof any more, there's none of that left." But fire chief Jean-Claude Gallet said that the structure of the cathedral had been "saved and preserved overall" and its bell towers, at one point thought to be at risk, were safe. The next step would be to cool down the building, he added. The first photographs from inside Notre Dame, published by news agency AFP, appeared to show smoking wreckage on the floor near the altar. Flames in the roof were visible through at least two holes in the vaulted stone ceiling, but apart from that there was little obvious damage to the interior. 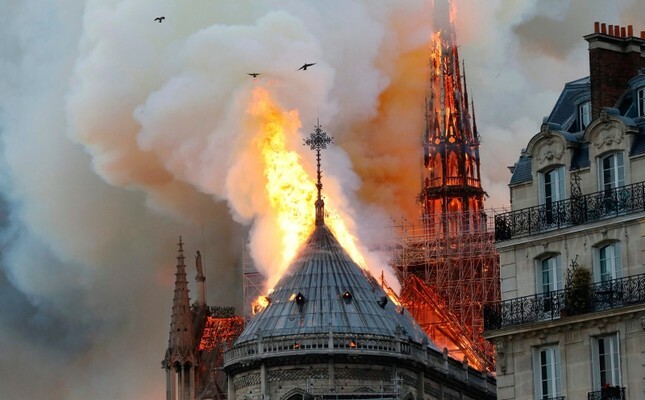 French media reported that the fire may have been linked to renovation work on the roof and the spire, which dated from a 19th-century restoration. The Paris prosecutor's office said that "as matters stand" it was investigating a count of "involuntary destruction by fire." Rector Monsignor Patrick Chauvet said the cathedral's most precious relics had been saved, including the Crown of Thorns, traditionally believed to have been placed on Jesus' head before his crucifixion. Cathedral spokesman Andre Finot told dpa that he had been just outside the cathedral when the fire broke out: "I'm shocked, I'm disturbed, I have no words, in fact I don't know what to say." Built in the 12th century, Notre Dame is Paris' top attraction by footfall: Some 12 million tourists visited in 2017, according to Parisian tourism authorities. The UNESCO World Heritage Site lies in the middle of the French capital and draws tens of thousands of worshippers and tourists a day. French internal security minister Laurent Nunez later said that the use of firefighting planes "would have presented a major risk, an utter danger for the structure." European Council President Donald Tusk sent his condolences to the people of Paris. "The Notre Dame of Paris is the Notre Dame of all of Europe," Tusk tweeted in French. Luxury goods magnate Francois-Henri Pinault said his family investment firm would contribute 100 million euros (113 million dollars) to the rebuilding effort, AFP reported.